Animal migration is a magnificent sight: a mile-long blanket of cranes rising from a Nebraska river and filling the sky; hundreds of thousands of wildebeests marching across the Serengeti; a blaze of orange as millions of monarch butterflies spread their wings to take flight. Nature’s great migrations have captivated countless spectators, none more so than premier ecologist David S. Wilcove. In No Way Home, his awe is palpable—as are the growing threats to migratory animals. We may be witnessing a dying phenomenon among many species. Migration has always been arduous, but today’s travelers face unprecedented dangers. Skyscrapers and cell towers lure birds and bats to untimely deaths, fences and farms block herds of antelope, salmon are caught en route between ocean and river, breeding and wintering grounds are paved over or plowed, and global warming disrupts the synchronized schedules of predators and prey. The result is a dramatic decline in the number of migrants. Wilcove guides us on their treacherous journeys, describing the barriers to migration and exploring what compels animals to keep on trekking. He also brings to life the adventures of scientists who study migrants. Often as bold as their subjects, researchers speed wildly along deserted roads to track birds soaring overhead, explore glaciers in search of frozen locusts, and outfit dragonflies with transmitters weighing less than one one-hundredth of an ounce. Scientific discoveries and advanced technologies are helping us to understand migrations better, but alone, they won’t stop sea turtles and songbirds from going the way of the bison or passenger pigeon. What’s required is the commitment and cooperation of the far-flung countries migrants cross—long before extinction is a threat. As Wilcove writes, “protecting the abundance of migration is key to protecting the glory of migration.” No Way Home offers powerful inspiration to preserve those glorious journeys. "While many conservation biologists have observed the decline of individual migrations, Wilcove's book combines them into an alarming synthesis." 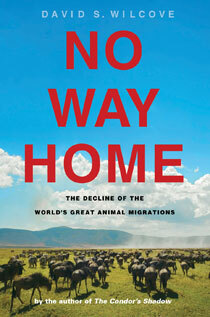 "Absorbing and thought provoking, No Way Home deserves to be widely read and used to promote conservation action. It illustrates the importance of science for deepening our appreciation of animal migrations and for guiding our efforts to preserve them." "[David] Wilcove's account is compelling. He paints a colorful picture of migration, supplying readers with many anecdotes about his encounters with various species on the move and the scientists who study them." "Startling and imaginative new wildlife book. . .Wilcove writes with a sense of drama, passion and awe for the incredible treks many animals make." "Skillfully balancing breadth and depth, Wilcove has written a fascinating and authoritative work. . ."
"No Way Home offers entrancing accounts of some of the world's iconic migrants of the sky, land, and sea while underscoring the obstacles they face in their travels." "No Way Home presents numerous examples of migratory species that seem to be heading down the same dead end path as Martha's brethren, but this is no doom and gloom tome...Rather, Wilcove...offers a seamless blend of research and personal experience that presents the history of migration, the problems facing species that migrate, and examples of programs that have had success in reviving declining populations." ". . .Wilcove's detailed descriptions of migrations of locusts, damselflies, quetzals, pronghorns, and many other species are convincing evidence that these awe-inspiring phenomena are worth saving." "This is an excellent and very important book. . . Wilcove gently provides a thorough lesson in the dynamics of migration. The prose is lively and filled with meaningful anecdotes; it's a well-crafted narrative that reads effortlessly. . ."
"[Wilcove] gives us not only a vivid and colorful description of the journey but inspects the marvel and intricacies of one of nature's phenomena." "Animal migration has been inspiring humans for millennia, but the grandest migrations are under increasing threat from human activity. David Wilcove explores the fragile balance between migrating species and the resources they need. The result is not only a fascinating account of these amazing journeys, but also an urgent call to preserve the varied habitats on which migrants depend." David Sibley, author of "The Sibley Guide to Birds"
"In this important and exceptionally well written book, a leading wildlife biologist shows how human activity is not just erasing species and ecosystems but also cutting the ancient natural highways that make possible Earth's greatest wildlife spectacles." "No Way Home is a captivating narrative...Wilcove's writing is an effective combination of anecdotes and hard facts...Reading this book will help us all see why a top priority is to protect the remaining migratory species and their ways home. I recommend it highly for students of conservation and restoration, as well as the broader public." "With no conscious effort, one emerges with the impression of having become expansively informed about the natural history of migrations, the research that has defined them, and the solutions necessary to conserve them." Are you planning to travel this summer? Not like these birds. In No Way Home: The Decline of the World's Great Animal Migrations, ecologist David Wilcove shares the science behind some of the most incredible journeys species make—and what threatens to end them forever. In the excerpt below, he traces the paths of songbirds traveling between cooler breeding grounds and warmer wintering grounds. In the meantime, he offers not just an awe-inspiring look at migration, but also insightful pictures of the birds in question and the scientists who study them. Highly recommended reading for your next airplane flight.